Humbucker HSS HSH Coil Tapping: What is it and why do it? Humbucker HSS HSH Coil Tapping, makes use of the physical design and construction of humbucker pickups. This has some inherent advantages over conventional single coil designs, principally in terms of the noise cancelling effect due to having two pickup coils in close proximity and with opposing magnetic pole pieces and coil winding directions. So not only are they relatively free of noise, but they sound different to a single coil pickup - fatter, but also not as clean. This is in part linked to the fact that two single coils of (for example) 8K Ohms windings each, effectively form a single 16k Ohm winding in a humbucker configuration. For more details of humbucker vs. single coil construction see the Guitar Pickups Explained pages. So since a humbucker is essentially made from two single coils pickups connected together, why not have the option to split them up to get a (pseudo) single coil as well? 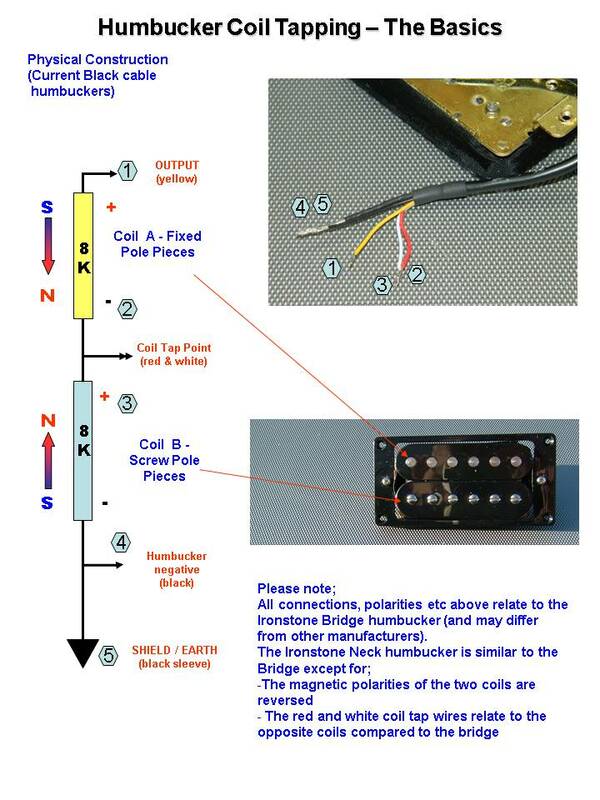 Enter the wonderful world of Humbucker HSS HSH Coil Tapping! Actually, just to keep some descriptive accuracy, a true coil tap would be to have a single coil winding where in the manufacturing process an additional connection is made along the 'length' of the winding and brought out to a separate terminal (on the bobbin for example). That would allow a user to select between the full coil output and a lesser output depending on where the tap had been placed. That is now quite a rare (usually custom) construction. The true definition of separating two humbucker coils to form a single coil would be a 'coil split', but somewhere in the wonderful world of guitar language, 'coil tap' has become the commonly used term and the one used in this article. As a start point, humbucker coil tapping requires one basic thing - the ability for the user to get at the physical connection between the two single coils that make up the humbucker. This normally means having a humbucker with both connections to both coils available, typically described as a '4 wire' connection humbucker. In practise, many humbuckers use a shielded connection cable, so you actually get the shield itself and the 4 coil 'ends', a total of 5 physical connections to play with. That is the way Ironstone humbuckers are constructed for maximum user flexibility. The only alternative if your humbucker does not have this is to tap onto the connection inside the pickup, but as this requires the pickup to be dismantled it can only be viewed as a high risk, specialist task. Assuming, like the Ironstone humbuckers you have a shield connection, that would always go to your guitars earth point even in a phase reversal circuit (see later). So now you are left with 4 connections representing the 4 ends of the two coils. The following descriptions are based on the Ironstone humbucker wiring colour code (different manufacturers may use different colour codes). The 2 diagrams below give you full identification for the use of the Ironstone humbuckers, with the current black connecting leads (see the bottom of the page for the previous grey cable variant). Coil tapping in this context is actually no more than electrically shorting out (bypassing) one of the coils, leaving the other one in circuit. Since humbuckers are normally made from two similar coils in terms of their resistance, it should not matter which one is bypassed. However, it may be desirable to match up the coil tapped humbucker to other existing single coil pickups in a guitar which will determine which coil to use (see HSS / HSH sections below). The actual bypass needs no more than a simple make / break switch, typically a mini toggle switch or a push pull switch mounted on one of the potentiometers. So in terms of cost, this is a mod that is about as cheap as it gets! There are effectively 2 fixed options illustrated in the circuitry below. Which ever coil is shorted out by the switch will leave the other coil 'live' as a single coil. The choice of which option to use is up to you. This should take into account any polarity matching (see HSS / HSH below) and any preference as to which physical coil you wish to retain with coil tapping active. For example if, as the ironstone humbuckers, one set of coils has adjustable pole pieces, you may choose to ensure that coil is 'live' in coil tapped mode so you can still benefit from the adjustments. Another factor to consider is the physical orientation of the humbucker in the guitar body. Simply put (considering a bridge mounted humbucker) , the coil physically nearest the bridge will have a more Tele-like treble twang and the one nearer the neck will have a somewhat fuller sound. Getting a little more adventurous, an idea for a variable coil tap is also shown above. Instead of a fixed switch, this uses an additional potentiometer connected in a similar way. In this example the potentiometer (a standard guitar pot) acts as a variable bypass on the lower humbucker coil - the upper coil remaining at full output in the circuit at all times. With the potentiometer turned so that the lower coil is fully bypassed, it acts just like the coil tap switch modification. The use of 250k / 500K potentiometers (relative to the much lower 8K Ohm pickup coil) means that when the potentiometer is turned fully the in other direction both humbucker coils will be in circuit at full output. Adjusting the potentiometer between these two extremes allows a progressive change between the two - a very neat tonal variation solution. All of the above is fine for a humbucker considered in isolation, but coil tapping is normally employed in HSS (humbucker bridge and single coil middle and neck) or HSH (humbucker bridge and neck and single coil middle only) configurations. A coil tapped humbucker is not a perfect imitation of a conventional single coil pickup - it still carries the constructional 'baggage' of the other coil, magnets etc - but its a shame not to explore the tapped tonal options! There are two additional factors to consider for HSS and HSH cases. The very nature of dual coil humbuckers means that they have a significantly higher output than either a pure single coil pickup or as a humbucker in tapped mode. So the issue to address is the best way to set the relative volumes across the guitars pickups (for the purpose of this article, it is assumed that a separate bridge volume control is not used - though entirely feasible). Probably the most practical method is to set the volume of the humbucker in tapped mode to be of a similar level to the other single coil pickups in the guitar by adjusting the humbuckers height (see also Pickup Adjustment on this site). The result is that in coil tap mode the guitar is balanced for volume through the 5 way selector positions, and coming out of coil tap mode will give a more powerful bridge output from the (now) full humbucker. Alternatively, setting the humbucker in balance to the other pickups in humbucker mode will probably give a relatively weak bridge output when in coil tap. All of this is also true for a coil tapped humbucker in the neck position of course. So here is the part where it gets tricky! Assuming you also want the coil tap to give you the benefits of those lovely Strat 'in between' switch settings, the tapped coil needs to have RWRP (Reverse Wound Reverse Polarity configuration (see Guitar Pickups Explained) compared to the guitar's middle single coil. 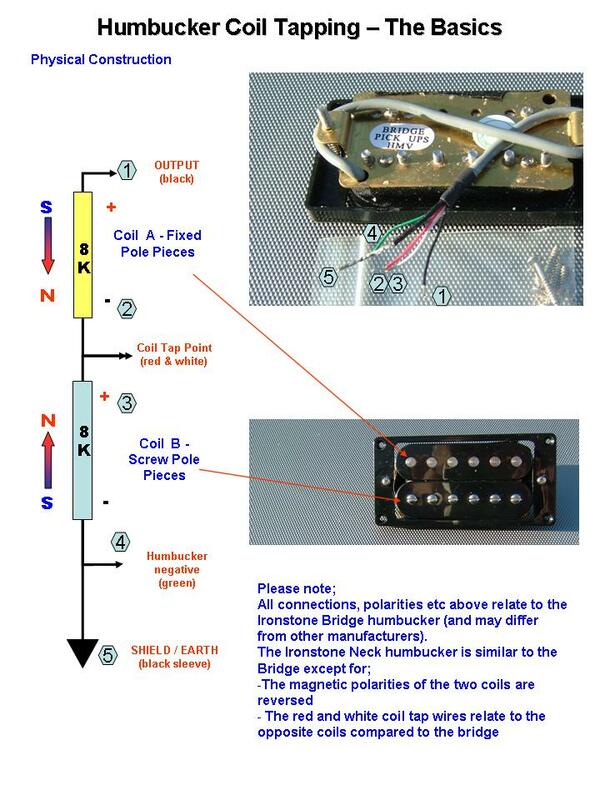 Taking this step by step, beginning with the magnetic orientation, whatever the magnet polarity of the middle pickup, one of the two humbucker coils will have the reverse (as one humbucker coil is North orientated and one South). Its just a question of working out which one you want to be 'live' during coil tap and ensuring that the correct coil tap switch option (1 and 2 above) is used. A small pocket compass is a great help for this. A little more difficult to work out is the winding direction issue. Just to clarify, the correct 'in-between' tones need the pickup winding to be reversed between the 2 pickups in use as well as the magnetic polarity discussed above. Luckily there is an easier way to do this than re-winding your pickups! Having decided which humbucker coil needs to be active in coil tap mode (based on magnetic polarity), the next thing is to physically try out the guitar (just put a couple of strings) and see if the 5 switch positions and coil tap are working correctly. If the bridge and middle setting sounds odd the winding direction needs to be reversed. An alternative method for determining coil winding direction is using a multimeter to monitor each coils output as you lift a small screwdriver or similar off the humbucker's poles - known as a pull off test. As you can see from the diagrams above, the Ironstone (and other quality humbuckers) give you access to the four ends of the two coils. To reverse the windings simple interchange the connection of (for instance) the green and white leads in the guitar (assuming that is the coil that remains live in coil tap mode). To keep the humbucker 'correct' in normal usage, the other two leads (red and black in this example) would also need to be reversed. Effectively the winding direction of both humbucker coils will now have been reversed to keep the humbucker 'bucking' while allowing the reverse wind match to your middle pickup. Well worth keeping a few notes as you go through this process of course! As mentioned at the start of this article, the shield should remain connected to the guitar ground at all times. This may require that the shield and green leads need to be physically separated from how they are standardly supplied new by Ironstone. The same principles apply for a Neck mounted humbucker in an HSH configuration that you again want to have with a coil tap option. 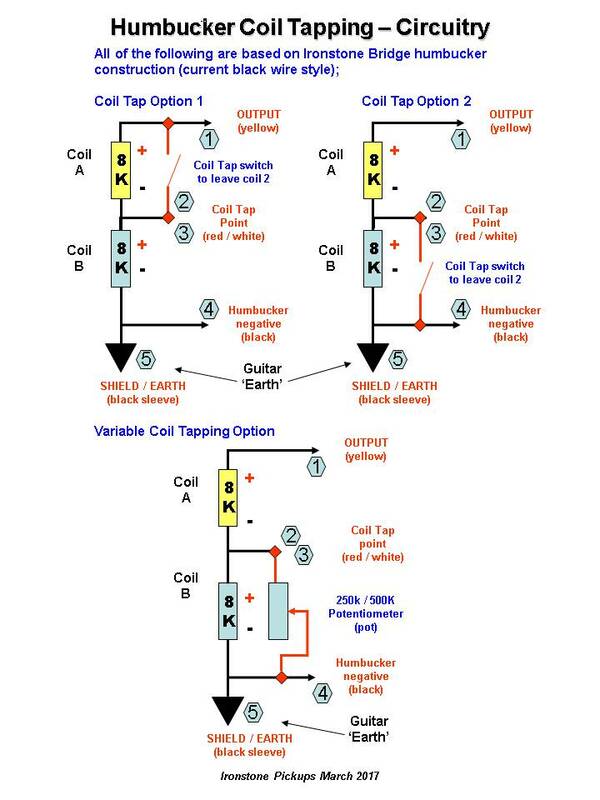 An interesting derivative of these switching options (used by some Ibanez HSH guitars for example) is the use of a conventional 5 way switch to apply an earth to the bridge and neck humbucker centre coil tap points when positions 2 and 4 are selected. The result is that in these two positions, the respective humbuckers are automatically put into a coil tap configuration (the 'lower' coil being shorted to earth) i.e two single coils in parallel as a standard Stratocaster. 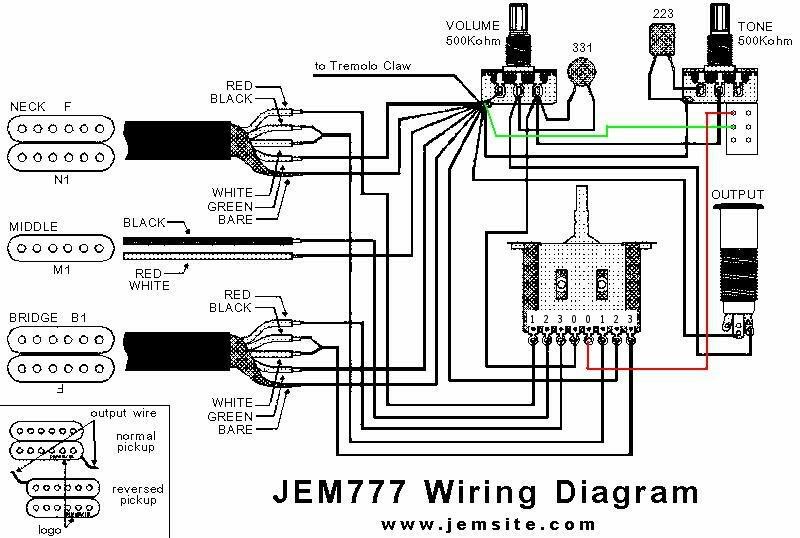 An example is shown below in the JEM777 wiring diagram. Its HSH but the same principle applies to coil tapping a single HSS humbucker. Note in Ibanez colour coding, the coil tap pair are black and white (red and white on the Ironstones). Note, as a separate option, the red and green wires on the diagram are a push pull switch arrangement putting both humbuckers into coil tap mode regardless of the 5 way switch. Just for completeness (these are not coil tap configurations as such), the other two simple humbucker modifications possible with a 4 wire system are changing the phasing of the two coils and connecting them in parallel. As previously described, changing the humbucker coil's winding direction is relatively straightforward and if just one of the coil is changed - leaving the other unchanged - the two coils will now be phase reversed (though the magnetic polarity is unaffected). This requires a slightly more complicated DPDT (Double pole Double Throw) changeover switch, again a toggle or potentiometer push-pull. Please note that this is not the same as putting (say) a bridge and neck pickup / humbucker out of phase with each other - a popular 70's and 80's tone from Page, Green, Summers etc. Putting a humbucker switchably out of phase with itself generates a lower output , non hum cancelling thinner sound as the two coils are physically very close and cancel out a lot of the 'common' signal. Probably not the most useful tone imaginable, but thats how some people like to roll! Parallel switching simply puts the two coils in parallel (just like in a normal Strat positions 2 and 4) as opposed to the series connection that has been described so far. Two 8K Ohm coils will now have an effective parallel resistance of just 4K Ohms and a consequently lower output level. They will however still be noise cancelling and sound brighter and cleaner than the series connection equivalent. In that sense this is an interesting , though rarely explored alternative to coil tapping. So as you can see there is a lot more to humbucker configurations than meets the eye. So even if you just love the sound of a humbucker, why not push the boundaries a little and take advantage of all of the other tonal possibilities on offer! If you have any technical questions, please do not hesitate to contact Ironstone. The Following 2 diagram explain the colour coding for the previous Ironstone Humbucker design using Grey connecting cables.